Boil moong dal with salt and sugar. Don't let it melt. Cover the fish head (cut into two pieces ) with salt, a pinch of turmeric and lemon juice. You can do without the lemon juice, but it adds a nice tangy flavour to the fish. Let it stay for 15-20 mins. Now heat some oil in a wok and deep fry the fish heads. Keep away. Heat 2 tsp of oil in a wok and add the red chillies and the cumin seeds. When it starts spluttering add the cardamom, cloves and cinnamon. After 30 seconds add the onion. Fry till it turns pink. Add the ginger and the garlic paste. Fry them till the oil sta rts leaving the sides. Now add the boiled dal along with the water. Bring it to a boil. Add the fish heads. Turn the heat to medium and cover, stirring occasionally. When the pieces are soft, break them with the ladle. Simmer till the extra water is absorbed. Cover the fish pieces with salt and a pinch of turmeric. Let it stay for 15-20 minutes and then shallow fry them for 2-3 minutes on both sides. Heat 2 tsp of oil (you can also use the oil left from frying the pieces). 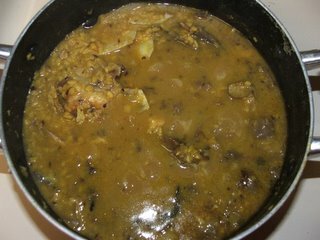 Add green chillies and kali jeera. Let it splutter for a minute or two or till the chillies are fried. Add the cumin and the coriander powder. Immediately add 1/2 cup of water or enough to make a nice curry, salt and a pinch of turmeric. Cover and let it simmer on medium heat for 4-5 minutes. Now add the fried fish pieces to the curry. Cover and again let it simmer for 4-5 minutes. Garnish with chopped coriander. This is part of the everyday food at home. It is simple and utterly yumm. 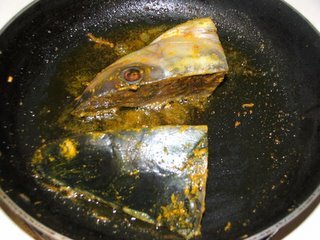 I usually cook fish and related dishes in mustard oil. The sharp taste of the oil enhances the flavour of the fish. 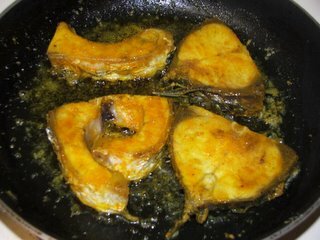 There is nothing more welcome than the smell of fish fried in mustard oil. But for those who like seafish more, the smell can be a little intimidating. But aah! You gotta try it to know. Both the above dishes are best served with hot steamed rice. Really interesting blog about super supplement. In a similar vain to super supplement, I've found the richest, purest omega-3 EFP fish oil supplement on the market. My health has improved dramatically - both physical and mental. I've been taking MorEPA now for about 6 months and I cannot emphasize how much this supplement have helped me to cope with anxiety and depression. The supplements can be ordered from **wwwomega3.com**. I'd also recommend daily exercise. What other drugs will affect Generic Viagra? Hi!You have such an interesting blog!BTW do you use 'kancha' moong dal ... I thought it was roasted first and then used for muri ghonto. May I suggest that you enable comment moderation so that you don't get these spams.Your blog does not deserve them.